Carol is not new to fostering community through the arts. A well-known potter, she has shared her passion for working in clay – through the Artists-in-the-School program at Chelsea Elementary, at Pierre Eliot Trudeau Elementary in Hull where she created a mural of ceramic tiles with the students, through workshops for homeschoolers or for Kingsmere Summer Camp, to the courses she taught at Dawson College in Montreal and Ottawa School of Art. With her sons grown, she has widened her field by earning a degree in Education. These days, if she is not in her studio, she can be found teaching Visual Arts in Ottawa area high schools. Born and raised in Montreal, Carol found her artistic direction by pursuing what she loved. Initially at McGill in Science, she transferred into piano performance. Two years later she enrolled in Fine Arts at York University, to graduate in 1974. “I kept experimenting, looking for my path. I tried film, animation, piano performance, electronic music.” Yet always there was this mysterious attraction to clay. 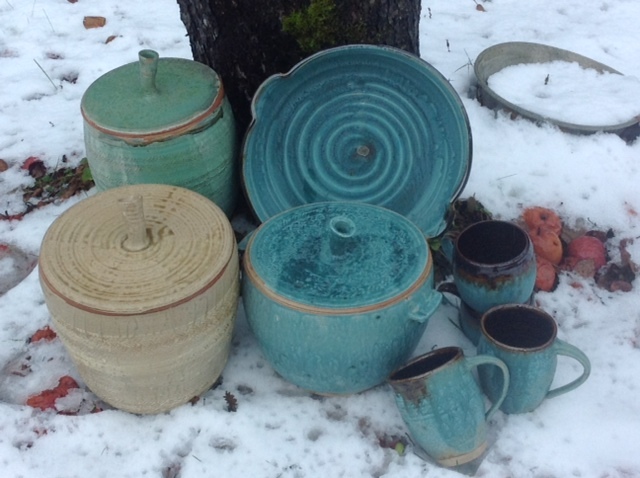 Whatever else she studied, Carol felt drawn to explore this hands-on medium – elemental clay, pottery, the marriage of earth, air, fire and water. She also produces sculptural pieces as well as architectural ceramics for fireplaces and indoor wall surfaces in bas-relief. Married to Dr. Mark Froimovitch, Carol lived for a time in the Meech Creek Valley where they opened his first Veterinary clinic in 1979. Surrounded by nature, she raised her three boys and discovered that working in clay could encompass everything she loves – her family, her friends, her animals. Everyday events came alive through her hands. © 2019 Catherine Joyce All Rights Reserved.